Leap Day — oh, it’s such the mysterious date on the calendar. Every four years it appears and gives us an extra 1,440 minutes. It’s a bonus day just hiding out in February. Sneaky, sneaky. 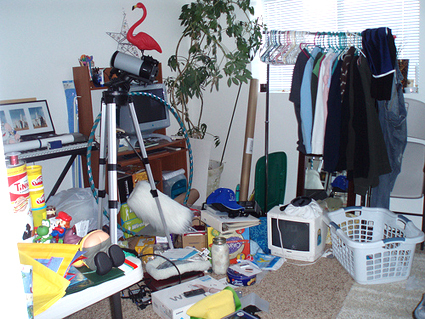 Just Chill: If you scramble around, wasting time looking for your reading glasses, mobile phone, remote control or car keys on a regular basis, it’s probably because you don’t have a designated place for things. While this idea sounds crazy, it works! Get a cafeteria-style tray – the kind with separated compartments – and a label maker. Label the sections: Keys, Glasses, Wallet, etc. Before going to bed, put these items in their appropriate place and set the entire tray, contents and all, in the fridge. AimeeRoo committed herself to shaping up the space, and even did it without spending a single dollar on the redesign. Other angles of the room include a dedicated arts and craft space and her washer and dryer. 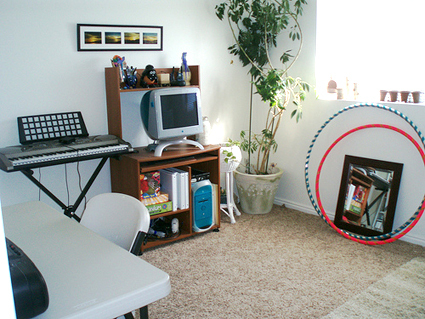 Before, it was a disorganized room, and now it’s a wonderful, transformed office. Great work, AimeeRoo! My husband and I are redecorating our bedroom. Our first step was to acquire a duvet cover we liked, and then we painted the walls a pale grey to match. Our next step was to decide on window treatments. After evaluating what I can only refer to as every single curtain option on the market, we decided to go with the Ikea Kvartal system. Our windows are around 11′ tall, and they let the most amazing light into the room. We didn’t want to block this light during the day, but we wanted privacy at night. We ran the three rail curtain rod (pictured at right) across the whole length of the wall. This allows us to pull the panels fully off the windows where they can act as artwork during the day. Also, we’re only using two of the three rails right now, and we’re planning on hanging artwork from the third rail like we do from our art gallery system. We like the versatility the system provides, too, so that we can easily and cheaply change the fabric as our tastes change. 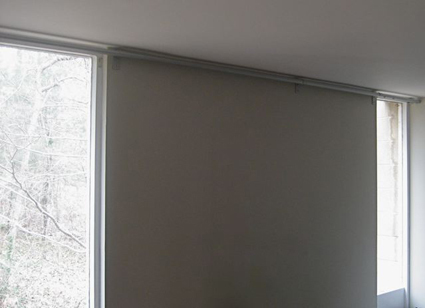 I’m writing about these curtains on Unclutterer because they have such a multifunctioning purpose to them — panel curtains, panel artwork, and an art gallery system. Additionally, they have a very clean aesthetic. 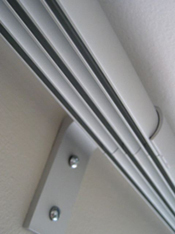 Fully assemble the rod and attach it to the wall mounts before hanging it on the wall. Like all things Ikea, serious assembly is required for this project. Also, I want to apologize for the poor quality of these photographs. I was trying to only shoot the top of the windows since the rest of our bedroom is in disarray with the redecorating, and it didn’t result in attractive pics. My father, a professional photographer, will be calling any minute now to instruct me about where I went wrong. Obviously, this is intended for small living spaces and isn’t going to be very useful for larger families. For a small space, however, it is well done. You may have eaten a few hardboiled eggs in your day, but have you ever eaten one in the shape of a cute little fish? If you or you child have been waiting for a more exciting ways to consume hardboiled eggs, your opportunity is now. Over at Slashfood, they highlight the fish mold for all your hardboiling needs. Those folks in Japan think of everything don’t they? Once you’ve had your taste of an egg in the shape of a cute little fish, you’ll most likely be craving for some more molded foods. Not to worry, the good people at the eBay Store in Japan have your sausage making covered with the Penguin Sausage Maker (pictured). Have you always wanted to have a little more fun when eating plain old sausage links? Your morning breakfast will be full of excitement when you take a bite out of a sausage link shaped like a lovable little penguin. Penguins not for you? How about sausage in the shape of a crab or an octopus? Either way, you’ll be living it up with your newly found love for molded foods. Wait, what about your kid’s lunch? You’re covered there, too. Boring sandwiches can now be cut and molded into bears, bunnies, or flowers. Take your pick. Now, go forth and eat some molded food! If you’re working on a project for a client and you want to show him three different versions of a design, now you can send him one uncluttered link instead of three. This service also works well for twitter posts and texting when you want to save keystrokes. If you have a link you want to share with us go to http://del.icio.us, and mark your suggested link “for:unclutterer” (without the quotes). CNET’s positive review of the Brother MFC-685cw Color Inkjet Multi-Function Center caught my attention mainly because of the inexpensive price and all the functions it performs. For a price as low as this ($130), you can’t really expect to have high quality photo printing when the device consolidates so many functions into one product. 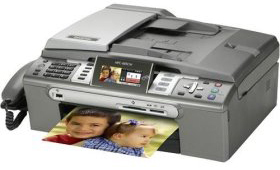 But, if you are in the market for an all-in-one printer, fax, scanner, copier, phone, answering machine, wireless network interface, and photo printer, this may be for you. You are sacrificing quality for quantity and run the risk of losing all functionality if one of the devices breaks, but you are saving space. Fewer wires and a smaller footprint for your home office can be beneficial to an uncluttered workspace. Two ideas recently converged for me in one device. The first idea is the notion of self-imposed limitations, and the second is the concept of retro-computing. The device is the AlphaSmart Neo. Here’s how it all fits together. I’m not the first to note the challenge that modern computing presents to human concentration. Writing is a hard thing to do, and when you have to do it, easy things like email, feeds, and Facebook can tempt and paralyze you. Many people agree that revision 5.1a, specifically, was the best version of Word that Microsoft has ever shipped, combining utility and minimalist elegance with reliability. Sadly for me, although it wasn’t strictly necessary, after a few years and a colour Performa I “upgraded” to Word 98, and somehow the magic was gone. Yes, I turned off all the crappy lurid toolbars and tried to make the compositional space as simple as possible, but by this time Word was stuffed with all kinds of “features” that let you print a pie-chart on the back of a million envelopes or publish your cookery graphs to your “world wide web home-page”, and it already felt to me that Word was only grudgingly letting me write nothing but, you know, words. Trigger Happy got out of Word 98 and onto the streets, but not without routine crashes and the occasional catastrophic loss of a few finely honed paragraphs. He goes on to say that he’s converted to WriteRoom and Scrivener, but not before giving us a tour of the tools that he’s loved the most. Apart from Word 5.1a, they include a Brother LW-20 electric typewriter with a 6-line LCD screen, and an ultraportable Psion 5. What he likes so much about WriteRoom and the rest, he says, is how much they imitate the single-minded purposefulness of those old tools. That brings me to the second theme in this story. One way to achieve zen word processing is to hide the fact that your modern computer is a modern computer. (Out there, no doubt, is someone who paid $1,800 for a MacBook Air only to then run WriteRoom on it.) It’s an attempt to travel back to a time before virtual tailfins. Another way to zen, however, is to simply use the tools from that era—the era in which word processing had been perfected. Another promoter of retro-computing is Andy Ihnatko who inspired me to look not just to old software, but to old hardware as well. He sings the praises of his NEC MobilePro 790, a Windows CE device he picked up for $10 at the MIT flea market. It doesn’t have the MacBook Air’s 1.6 GHz or good looks, but it matches its weight, comfortable keyboard, and more than serviceable screen. But when distraction-free writing is the goal, the latter matters more than the former. I think I did Andy one better, though, or at least more retro. I discovered the AlphaSmart Neo, in part thanks to Paul Ford’s writings because the Neo is his companion to WordPerfect. What is the Neo? It’s a full keyboard with six-line LCD attached. That’s it. No distractions. It’s a thing of beauty. At an all-day conference my three-hour battery on my Mac isn’t much help and I have to be on the hunt for limited power outlets. (The NEC MobilePro wouldn’t fare much better.) The Neo’s frugal processor and simple screen, on the other hand, gets me 700 hours from 3 AA batteries. That’s about a year’s worth of normal use. The keyboard is amazing. It’s a real, honest-to-goodness keyboard with satisfying travel and quiet clickitiness. It really feels better than my Apple Bluetooth Keyboard, which is the same design as the Air’s. It also beats out the MobilePro’s slightly cramped keyboard. AlphaSmart was started by two former Apple engineers and it has overtones of the eMate 300. Like the eMate, the AlphaSmart was designed for the education market, and it shows in the build quality. If it’s tough enough for kindergardeners, it’s tough enough for me. Most important, though, is that it keeps me focused. If I go to a coffee shop to get some work done, the only thing I can do with my Neo is write. There are no distractions. There isn’t even bold or italics (something I get around with Markdown). When writing is the only thing you can do, you get it done, and it remains an enjoyable activity because it’s not the thing that’s keeping you from Twitter. At some point in our technological past we perfected word processing. Every feature since then seems to have subtracted from the experience. Do yourself a favor and look into some single-purpose, “underpowered,” and self-limiting tech. 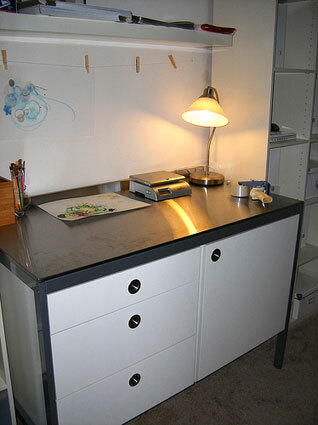 I particularly appreciate how Vitamin Design has repurposed an Ikea kitchen island into a standing art desk. The stainless steel that is helpful in a kitchen is fabulous when working with paint. It’s nicely organized, to boot! If you’re just starting out or are interested in redoing your office and you’re into the look that Design Within Reach offers, this is actually a decent sale price. 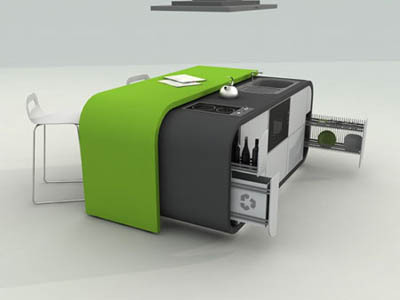 You get a Tavola table, Panton chair, Leaf light, a Cubits Shelving unit, and a file cabinet on wheels. Plus, it comes with free shipping. Not too shabby. As a final note on this specific topic … I own a Panton chair and should warn you that it carries quite a big static charge during winter months. If I sit in it, the next thing I touch gives me a shock. I even run a humidifier full time in my home. It’s not a deal breaker in my mind, but annoying enough that I thought I would share the information. Along with the idea of an instant office, Reader Chris brought to our attention the Apartment-in-a-Box. Quite interesting! The Socket Sense surge protector handles all power adapters with ease. Simply expand or contract the movable sockets to adjust for the best fit. Compare this to a typical surge strip where power adapters typically block one or more sockets. 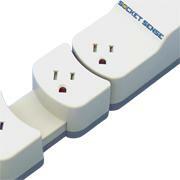 Socket Sense can do the job of two ordinary surge strips. Instead of using two surge protectors or possibly swapping plugs in and out of your surge strip, this looks like a very useful and innovative alternative in the war on cable clutter.